What is holding you back from giving STONE IMAGE CONCRETE DESIGNS a call? Do you have questions? You aren’t sure if you understand the whole process? Today we are going to answer many of the common questions we are asked. If you have any unanswered questions feel free to give us a call! Decorative concrete, can most easily be described as any technique that alters what would be plain, grey concrete to be more aesthetically pleasing. Decorative concrete can encompass many different looks and techniques. It can include simple coloring techniques such as acid stains, acrylic stains, concrete dyes, and integral colors. It can also include special treatments including stamping, scoring, chiseling, and polishing that can change the texture of the surface. The concrete can be applied to the surface by spray or hand trowel. There is also epoxy flooring that works great in commercial settings or kitchen interiors due to easy clean up and low maintenance. Many times, decorative concrete integrates multiple techniques to truly customize the piece. 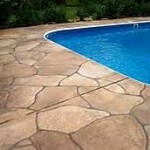 Decorative concrete resurfacing has been found to be much more cost effective than wood or tile flooring. No you do not have to have your driveway ripped up and concrete re-poured. The original piece, whatever you chose to be resurfaced such as driveway, pool deck, kitchen floor, porch, or gymnasium, will simply have the top layer grinded down. If there is tile or brick presently where you would like decorative concrete, our skilled technicians will remove it. Once the concrete resurfacing is done it is simply sealed. There are no grout problems with mold or pieces falling out with decorative concrete. There are also no visible surface scratches with decorative concrete like you would experience with wood flooring. Give Stone Image Concrete Designs a call and Russell will come out to your home with samples. You show him what area you would like resurfaced and he will supply you with ideas and provide you with all of your options. The possibilities are endless. Stone Image Concrete Designs offers many different textures and designs. Decide on area to be resurfaced. Decide on what colors, designs and textures. Estimate is written and agreed upon. Find dates that fit the client’s schedule. Prep work begins. Which may include tile or brick removal, Grinding, fixing cracks, or filling in holes. Depending on the designs or details, tape and plastic will go up around resurfacing area. Concrete, stain, and color applied to area. Add your own unique style to your home! Give us a call. Contact Stone Image Concrete Designs on line via our contact form, email address or by calling for decorative concrete at 352-529-1138. Our team of trained staff can help choose the best options for your home, providing long lasting, durable decorative concrete that you will be proud to show family and friends. Call us today to request a brochure, schedule a consultation or to get an estimate.